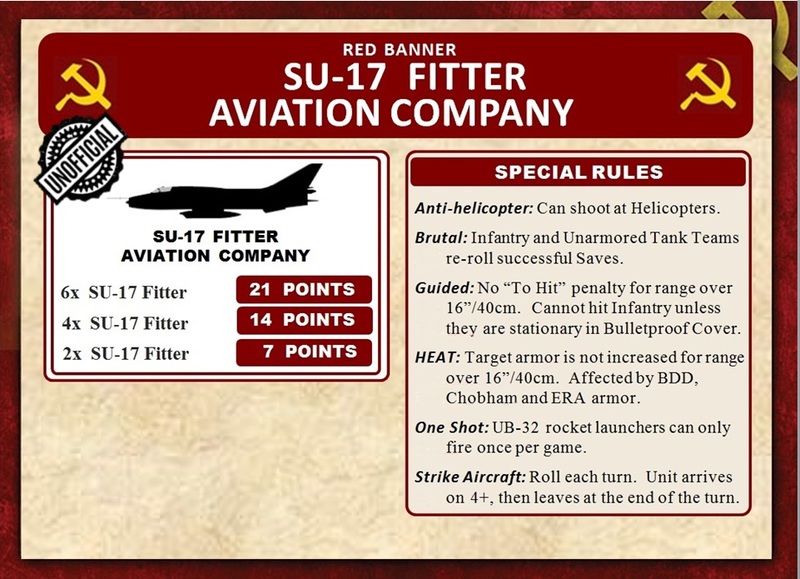 As promised in a previous thread, below are SU-17 and SU-22 cards for TY. 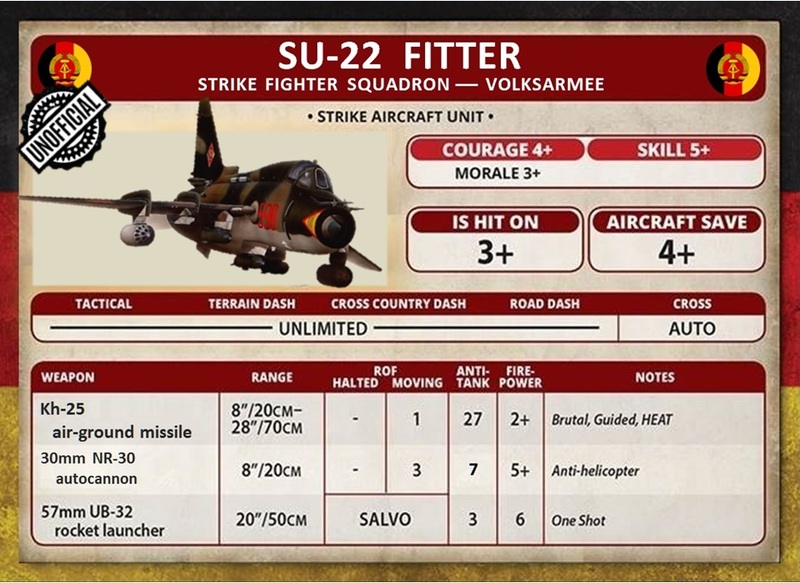 The SU-22 is the export variant so it stands to reason that it goes to the East Germans. I kept the Aircraft Save (4+) the same as the SU-25's since they're the same points cost, even though as rugged as the Fitter may be, it probably should be a 5+ save in reality. Volksarmee SU-22. 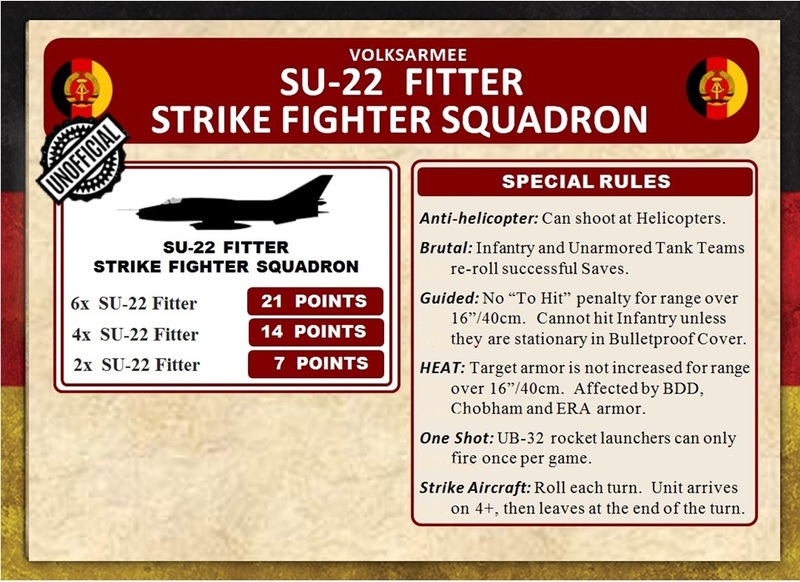 I'm calling it "Strike Fighter Squadron" because it's consistent with the Volksarmee's Mi-24 "Battle Helicopter Squadron"
And here's the revised MiG-23BN card increasing the maximum number of aircraft to 6. I also touched up the front pic a little bit. I just added 2 more for a total of 6 myself. That's 1/3 of the LSK's entire MiG-23BN inventory! Thank goodness the title was wrong. I couldn't imagine what an Su-15 would be doing on a Team Yankee tabletop! If the Sovs try they might be able to make a ground attack variant of the SU-15 interceptor. Though I prefer the MiG-23, Academy 1/144 SU-22's are available and quite cheap to obtain as SU-25 substitutes. By request I am reposting these since the original pics are broken. In 1969, the Sukhoi OKB investigated options for a new battlefield close-support "mudfighter" aircraft, one option being a derivative of the Su-15 designated the "T-58Sh" -- where "Sh" stood for "shturmovik". The T-58Sh looked like an Su-15 mated to a MiG-27 front fuselage, with broad wings featuring moderate sweep, eight stores pylons, heavy armor, and a built-in Gatling cannon. 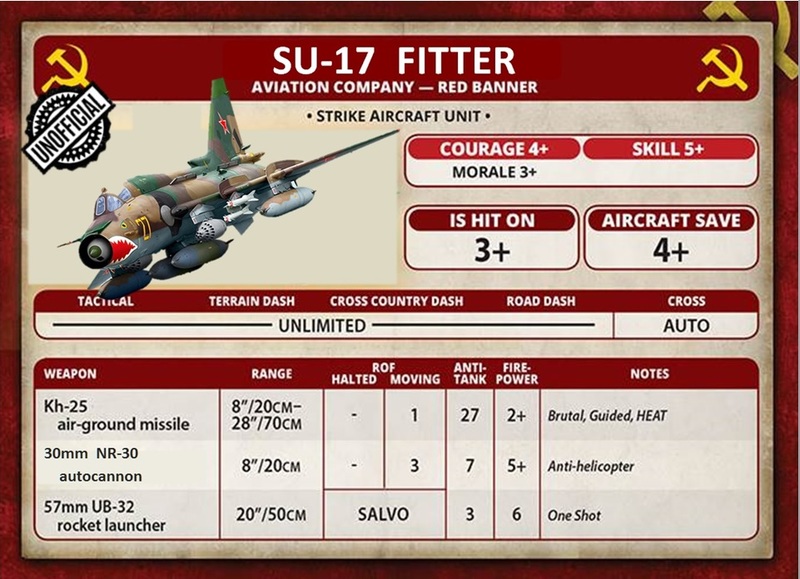 An all-new design was selected instead, resulting in the Su-25 "Frogfoot" mudfighter. Not a TY player but very nicely done cards- and good for game accuracy too, as I believe there were more SU17/22s in Warpac Ground attack units than all other types put together. Looking at the returns for the CFE Treaty inspections of 1990-1 in Eastern Europe- the SU25 seems a comparatively rare bird, but there were regiment upon regiment of SU17s.